Nature is my biggest inspiration. The earth and all of it's wonders spark my imagination and I can't help but create. 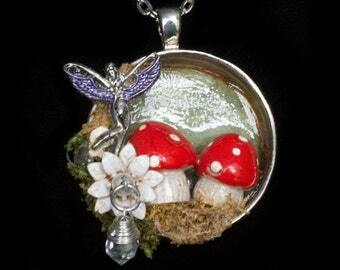 I walk though the woods behind my home and studio and examine all of the wonders in the forest. You too can examine creation and be inspired. 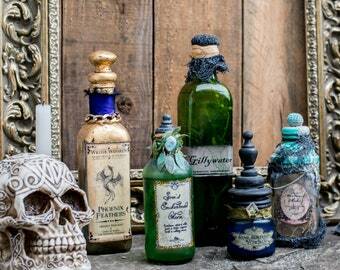 This apothecary bottle set can be used to collect specimens or hold your herb mixtures for potions, cosmetics making, spells, soap making or perfume making. The coffee stained papers are perfect for taking notes on, making sketches or studies of what you found or for writing spells. It comes with 15 pieces of hand aged and distressed paper, a real twig pencil, 10 blank labeled, clear glass apothecary bottles with cork stoppers, all in an altered, solid wood,cigar box that I altered with a brown felt liner that has compartments for the bottles and the papers. The altered box also has wood and metal filigree embellishments on the outside as well as paper, ink and feather embellishments on the inside. 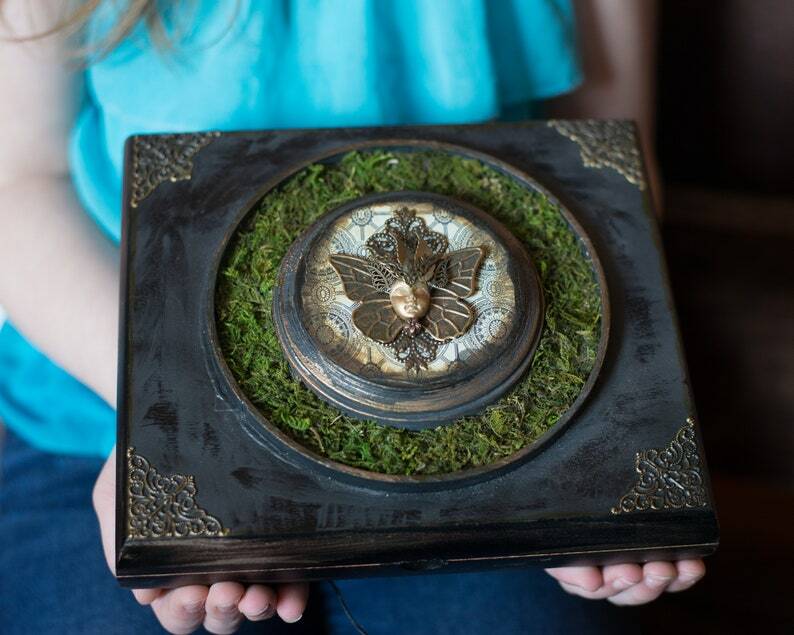 But the crowning piece on this mixed media altered box is the fairy face assemblage on the lid of the box encircled with real moss. 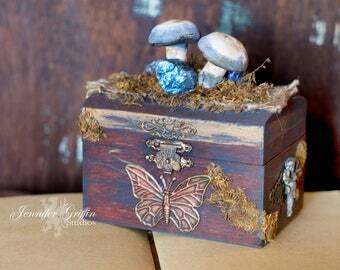 The apothecary box measures 10" x 8" x 3 1/4" (including the feet on the box). 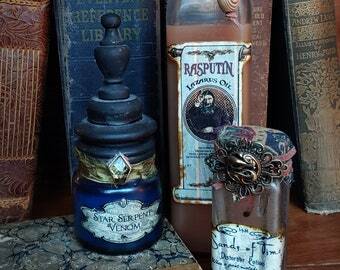 4 Apothecary bottles measure 2" (not including the cork stoppers) and are 3/4" in diameter. 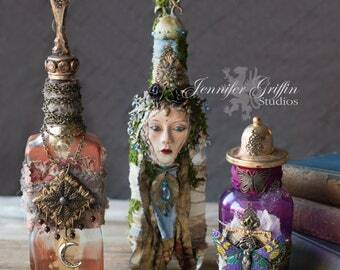 6 Apothecary bottles measure 4" (not including the cork stoppers) and are 1/2" in diameter. This item is non-returnable. Please ask any questions before purchasing. If you need more images of the piece I can do that for you as well. Please note that the box is vintage and therefore shows some wear and age.